It’s been a great start to the art show season! At the first show of the year I got to witness art in community at the Old Capitol Art Fair in Springfield, IL. 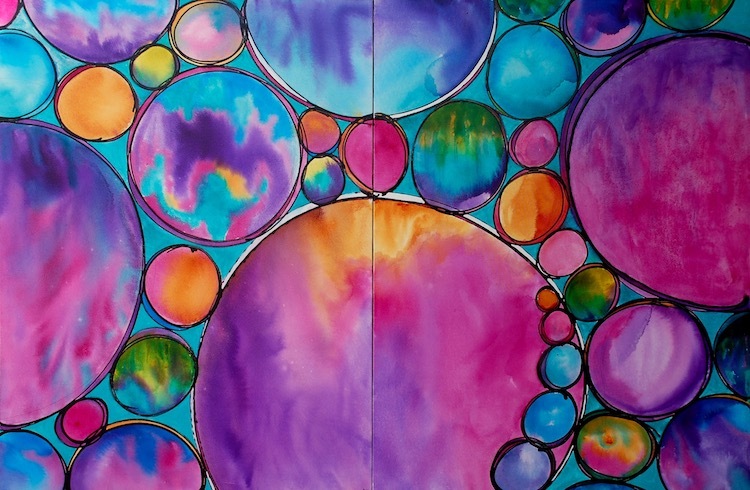 My painting “Spheres of Completion” was the featured artwork for their yearly Community Project. Together the community created an enlarged 6 ft x 10 ft painting made up of 308 5 in x 5 in painted squares based off of my original painting. 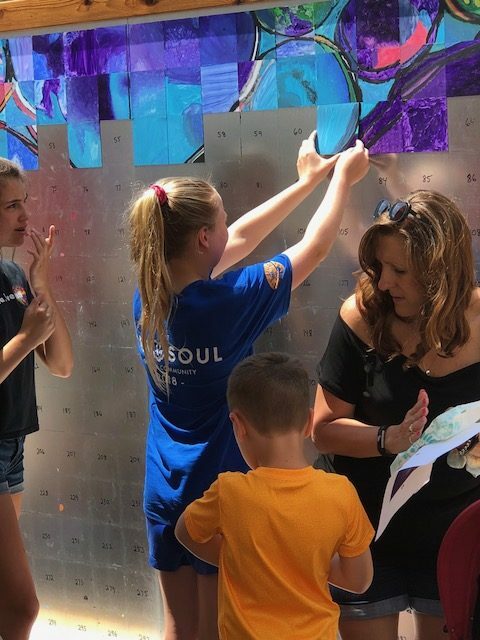 I so enjoyed watching the process as each one of the squares were painted by individuals in the community and then piece-by-piece added to a large magnetic frame. I even slipped away from my art booth for awhile and got to paint my own square tile and have it added to the mural. 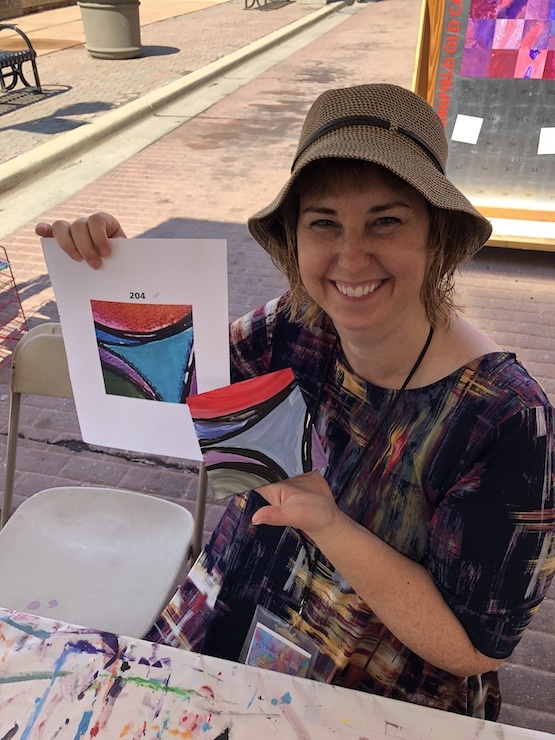 So relaxing to get to paint during an art fair! 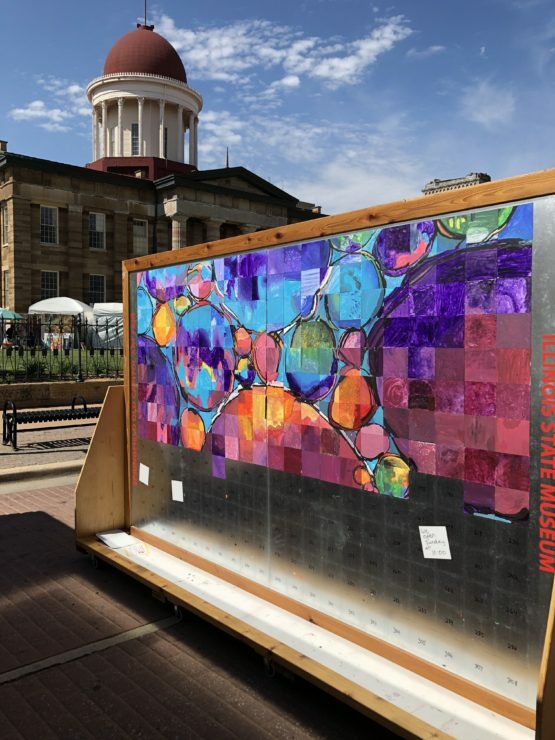 The completed community project piece will be on display at the Illinois State Museum for the next two years and at the 2019 Old Capitol art fair. 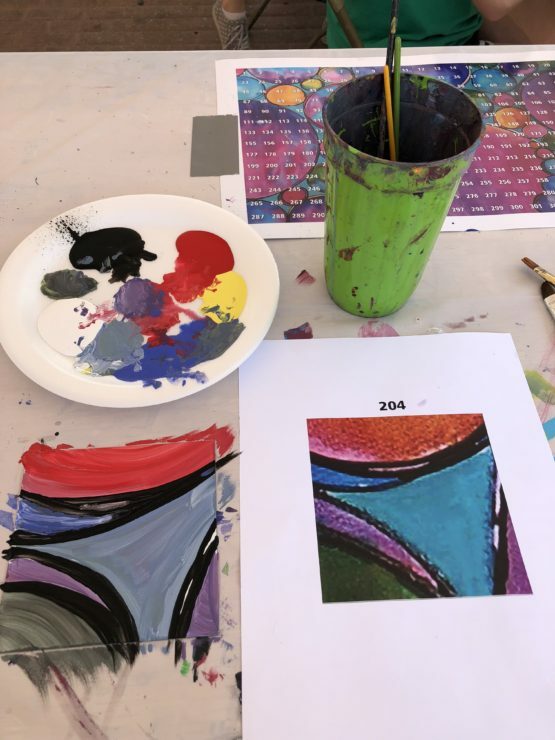 It was really thrilling as an artist to watch the cooperation and creativity in action as festival goers participated in this interactive project by painting their very own section of the finished piece! I just love all the juicy colors and individual brushstrokes! Finished! What a tremendous job by the community of Springfield to complete this painted mural project during the Old Capitol Art Fair!!! This project was brilliantly constructed and organized by the committee who organizes the fair-GREAT WORK everyone! The Springfield show also had a Children’s Art Tent where only kids were allowed to shop for their own pieces of art. Artists at the show donated work which was priced at $4, $5, or $6 and then the kids got to pick out their favorite pieces. 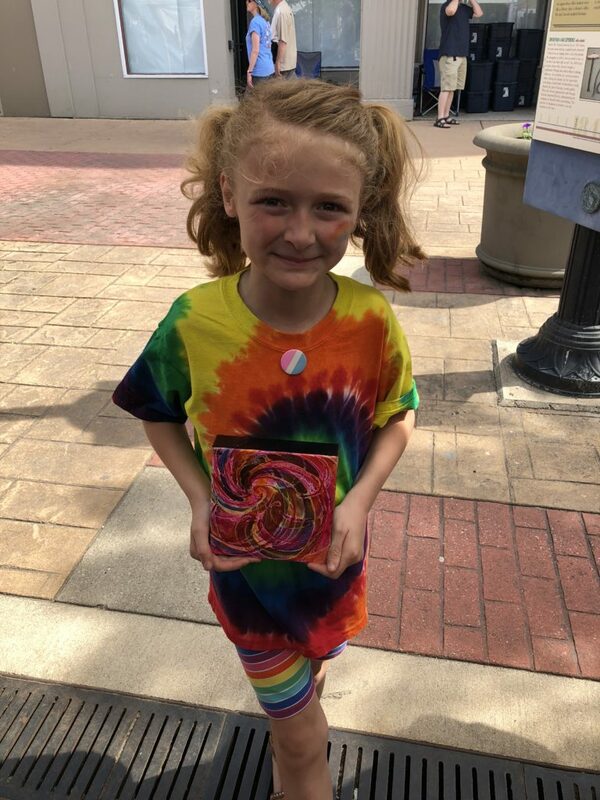 It was so great to have kids stop by the booth and show me their painting of mine that they selected in the Kid’s Art Tent. Another great way of making art accessible to all members of the community-even the very youngest ones. 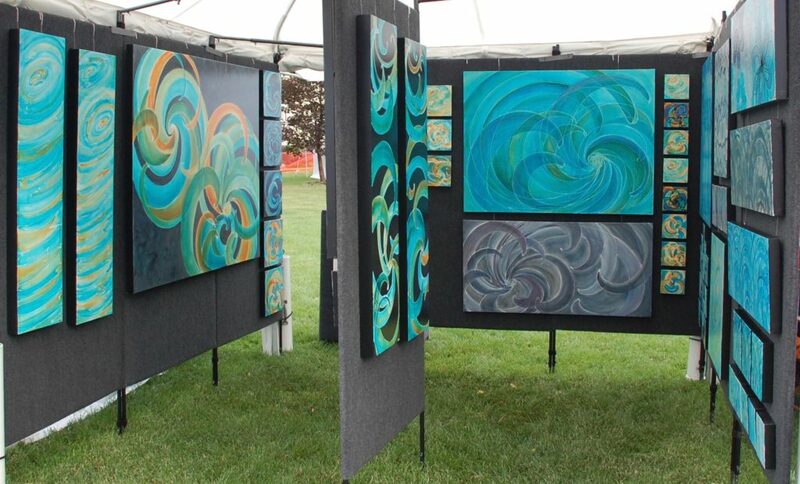 The first weekend in June brought us to the Mulvane Art Fair in Topeka, KS. We sweated through a super hot set up day, but then the temperatures dropped and we had two fabulous art fair days on the campus of Washburn University. It was so great to meet so many new art friends in Topeka! The studio is hopping in between all these shows as we also do final preparations for shows in Brookings, SD and Aspen, CO in July. We’d love to meet you on the road or if you happen to see a painting you are interested from my photos from the art fairs, please feel free to contact me and we can deliver or ship it out to you! I’m pleased to announce that my painting “Spheres of Completion” will be the featured artwork for the Community Project at the upcoming 57th Springfield, IL Old Capitol Art Fair on May 19 and 20, 2018. 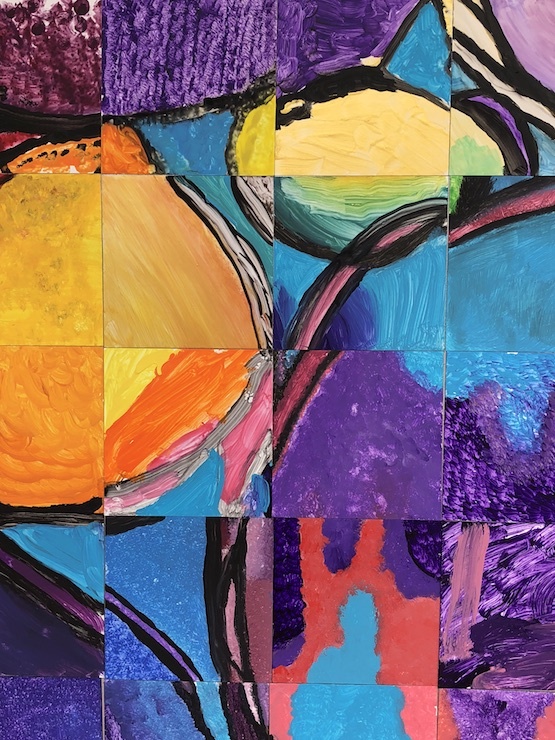 An image of my painting “Spheres of Completion” will be enlarged to 6 ft x 10 ft and then divided into 308 5 in x 5 in squares. Each one of these squares will be painted by the public and adhered to magnetic tiles at the art fair. Then, piece-by-piece the painted squares will be reassembled on a large magnetic board. 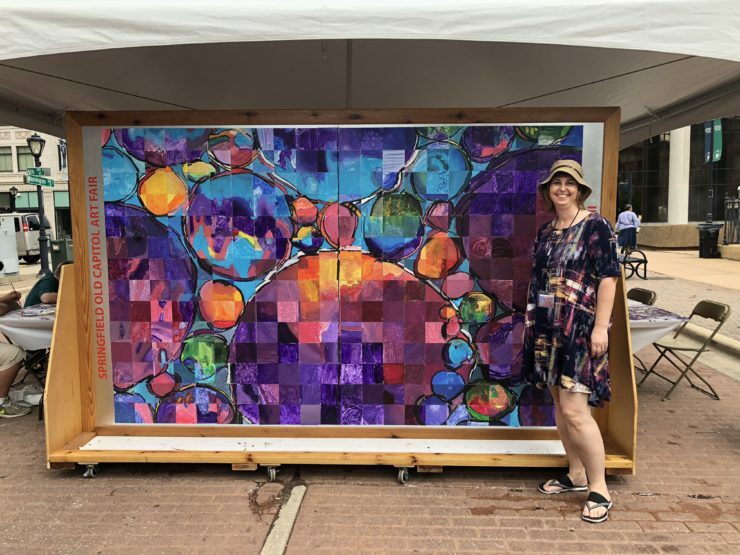 The completed community project piece will be on display at the Illinois State Museum for the next year and at the 2019 art fair. I’m looking forward to seeing cooperation and creativity in action as festival goers participate in this interactive project by painting their very own section of the finished piece! Come join the fun this Saturday, May 19 from 10am-5pm and Sunday, May 20 from 10-4pm. In celebration of the community project at the Old Capitol Art Fair, I’ve created a series of mini-works inspired by the original painting “Spheres of Completion”. 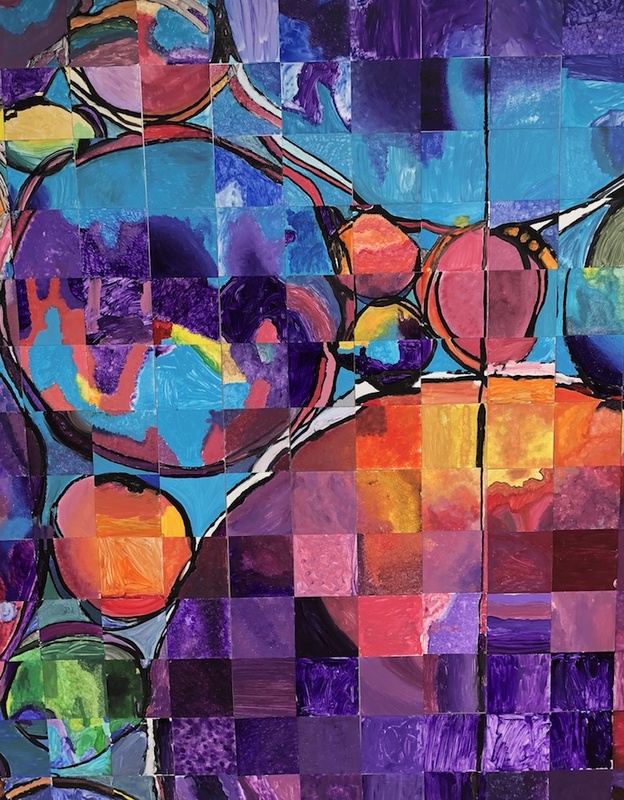 Stop by Booth #95 to see the original “Spheres of Completion” painting and see the inspired mini-works in a similar rainbow color palette which will be available for purchase. There will be so much color for everyone to enjoy!